This is my favorite summer salad of all time. Make it the night before and let it sit in the fridge so the flavors can marry. This salad is just so versatile it goes with anything! Fantastic with BBQ steaks, pork chops, hamburgers and grilled fish, or on it’s own as a lunchtime snack. Half or quarter the potatoes depending on size. 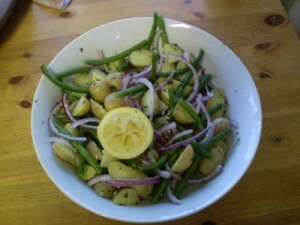 Boil the potatoes & green beans (cooked, but still firm- not mushy.) Strain them and leave to cool. Zest one lemon into a large bowl then add juice from both. Add a good splash of apple cider vinegar & garlic cloves, finely chopped. Sprinkle with salt & pepper and add half a red onion, thinly sliced. Chop the hell out of the thyme leaves and add cooled potatoes & beans. Stick it in the fridge rotating mixture regularly. Serve cold.